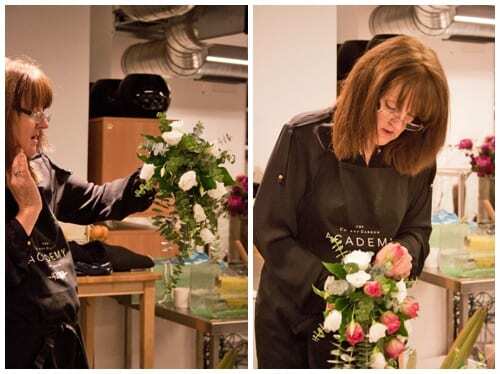 I hoped you enjoyed day one of the Wedding Flowers course which I recently attended at the Covent Garden Academy of Flowers. We started day two with a visit to New Covent Garden Flower Market with Gillian and her colleague Robyn. 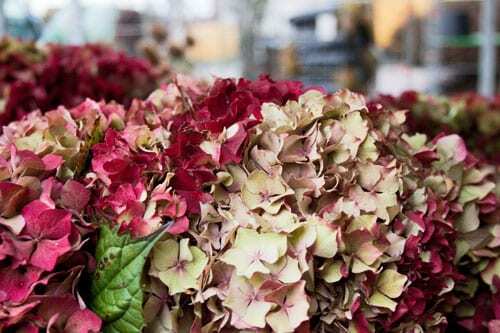 These first few images show the Porters Foliage stand with gorgeous autumnal hydrangeas, eucalyptus and lots of different types of foliage on display, together with sparkly twigs for Christmas arrangements. 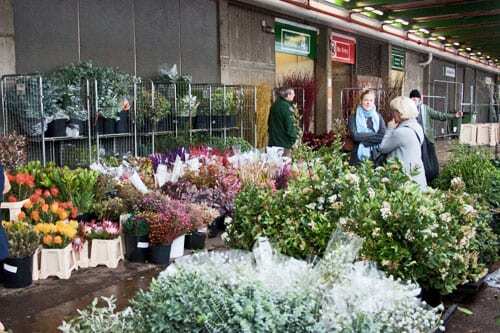 We also had a look inside the market around the flower stands, before being amazed by the huge selection of floral sundries at Whittingtons. 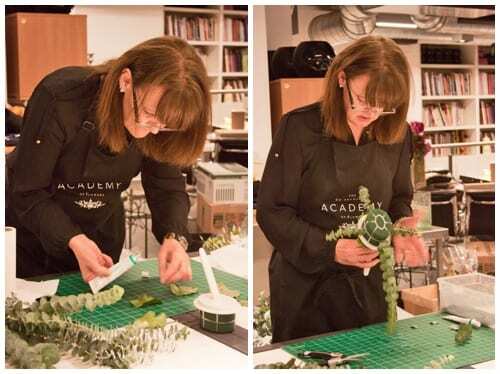 Then it was back to the Academy, where Lynne demonstrated how to make a teardrop-shaped bridal bouquet. After soaking the oasis holder, we attached galax leaves to the back of it with floral glue. 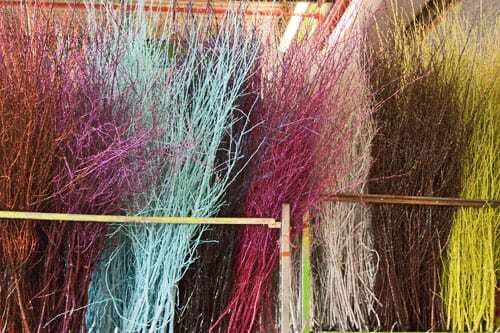 Then with ‘Baby Blue’ eucalyptus and berried ivy, we ‘greened’ up the design. 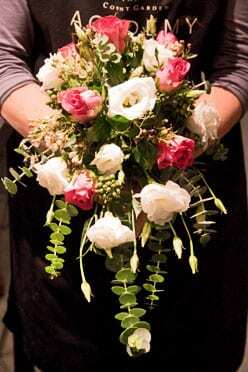 We added white lisianthus, pink roses and waxflower, and finished off the bouquet by covering the handle of the holder with ribbon. After lunch, we practised our wiring and taping by creating a corsage. 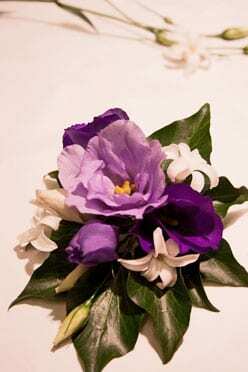 Lynne showed us how to wire lisianthus flowers, buds and hyacinth pips. Here are my components below. 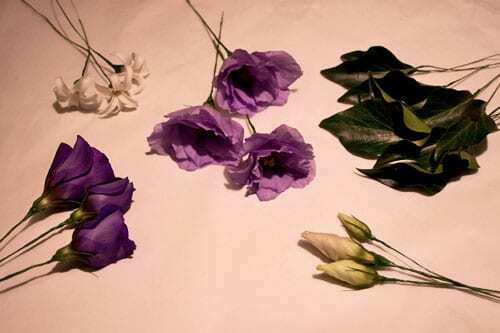 To construct the design, we started off with the ivy leaves, placed the lisianthus buds towards the edges of the design and the flower heads in the centre…but all the time keeping the same binding point. When we were happy with the overall arrangement of the flowers and foliage, we secured the binding point, cut off excess wires and then taped it. Below are the two designs I created. Many thanks to the lovely Pam for modelling the bouquet. We all had a really wonderful time on the course and I’d highly recommend it if you’re planning on creating wedding flowers. Nothing was too much trouble and there was always help on-hand if you had any questions.